Reader Leslie is a busy deal finder today. She brought us the Driscoll coupon as well as let me know about Rite Aid’s Gift of Savings program. 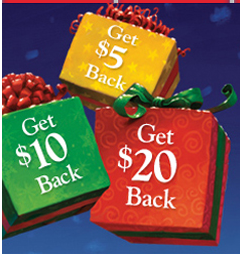 From now through December 24th, you can get up to $20 back when you shop at Rite Aid. Earning your gift certificate is as easy as 1-2-3. 1. Save all your Rite Aid receipts dated November 22 through December 24. 2. Enter all of your information and the codes from your receipts here.